How does providing transportation and logistics services land you a student center at the hometown university with your name affixed to it? Something to do with the degree of service and commitment – one which Chuck Bills has long laid down as CEO of Ohio Logistics, one of the nation’s fastest growing logistics organizations. At the heart of this is a business emblematic of Ohio’s key position in how goods get from manufacturer to us. Ohio Logistics’ expansion during its 30-year history has been impressive. The company headquarters in a state from which truckers can reach two-thirds of the U.S. population and 60 percent of its companies in a single day. 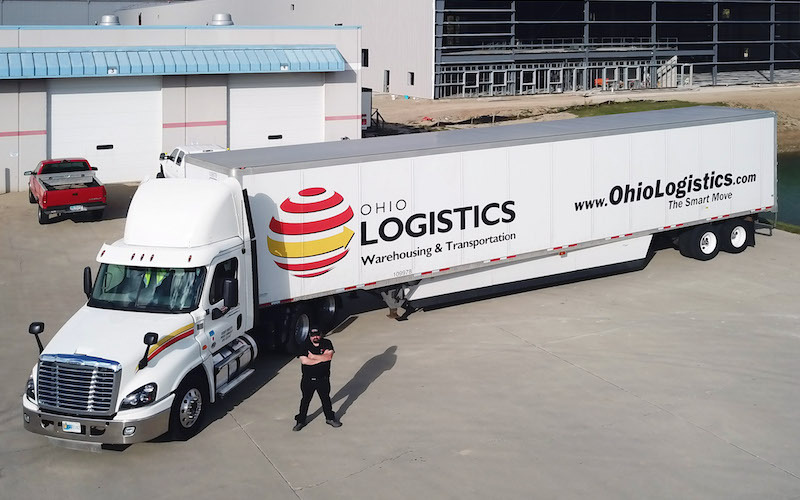 Ohio Logistics has grown from a single 40,000-square-foot warehouse to over 6 million square feet, spread across 22 state-of-the-art facilities in six states. It makes the company, headquartered in Findlay, one of the largest privately-held logistics firms in the eastern U.S. In 2018, the company has welcomed three new ground-up facilities, in the Ohio cities of Bellevue, Bowling Green, and Findlay. The 200,000-square-foot Bowling Green operation opened within the Wood Bridge Business Park, which is filling with a variety of major firms, including GKN Manufacturing, an automotive supplier. It opened for business in early summer. The Bellevue operation, which just opened in October and is also 200,000 square feet, includes six railroad and 17 semi-trailer docks, along with one overhead ground-level door. Another operation, in Fostoria, builds upon the area’s historical past with railroads, running along the three lines that intersect in the old “Iron Triangle,” where railroads served a natural gas boom. Among the clients for which it provides storage and transportation are Mitsubishi Chemical Performance Polymers and U.S. Gypsum Building Materials. A German steel company will also be involved after the railroad access is fully completed. Finally, the company built a 150,000-square-foot warehouse to lease to a business client. It was scheduled to open in December. As 2019 rolls around, Ohio Logistics will continue its southern and western expansion by adding facilities in two new states, Tennessee and Illinois. The company currently operates in Ohio, New York, Indiana, Pennsylvania, Georgia, and Mississippi. The technology used to carry out the daily logistics operation is equally impressive. Ohio Logistics works primarily with two vendors, Argos Software with its solution suite and Abecas Insight Software with its mobile, web-based solution. The result is a highly intelligent warehouse management system that quickens agility and flexibility, supporting many virtual customer warehouses. It supports bar code, RFID, and voice technology for maximum automation in warehouse facilities, as well as offering real-time visibility to customer inventory.